Divide your trip days/mileages as you like. WINTER OFF-SEASON ROUTE we'd use. It avoids the mountains and all East Coast large cities! From Canada take I-87 South towards New York City. From New England take I-84W to I-87S to I-287S around NYC. Then from I-87 use the right lane to take Exit 15 for NY-17S/I-287S. Keep right to stay on I-287 S (for 45.6 mi). Take I-81S (connecting just North of Harrisburg. Due to harsh Winters in the Northeast and most campgrounds water pipes being buried close to the surface there are few that remain open during the Winter months. What to do? need normally and they will suffice. Be alert in rest areas after dark. to be sure they are open and have a space for you. Another option is Cracker Barrel Restaurants. 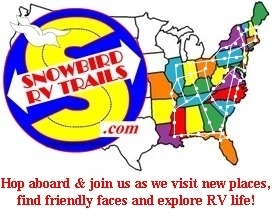 They have great food and most are very hospitable to RVers. We overnight at this campground regularly mainly because it is so convenient to I-81. The price is more than we usually like to pay but throw in the amenities like free cable, fair WiFi and a decent cafe that will deliver lunch or dinner to your door and it works for a night. Each site is a pull-thru with concrete pad and full hook-up (FHU). It’s an easy drive to visit Hershey Park from this campground or they do offer a free shuttle bus ride (Summer Season) to Hershey Park when admittance tickets are purchased from their office. There is also a large truck stop for fuel at this Exit. 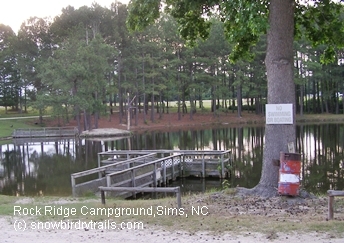 Always phone ahead to any "open year-round" campground to be sure they are open and have a space for you. 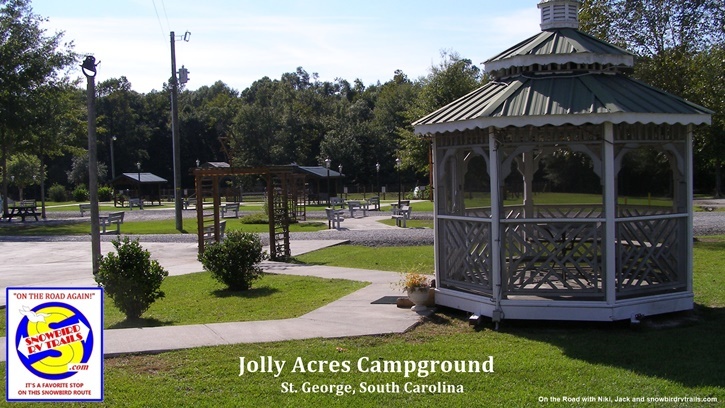 Be sure to phone ahead to any "open year-round" campground to be sure they are open and have a space for you. Located 6 easy miles off I-95 - we like it because it is out in the country - clean, quiet, peaceful and run by nice, friendly people. Becky owns the place and is always making improvements. She also raises champion Boxer dogs. They have pull-throughs, 30 Amp, good water, a dump station, propane and laundry facilities. Jolly Acres is usually nearly filled to capacity with Snowbirds during the Winter months but call ahead and Becky can normally fit you in for a night or 2. Owned and operated by Chef Noah Coleman and his wife. They know how to properly prepare the really good down-home Southern staples. They are open for lunch from 10-3 and for dinner from 5pm to 10pm but closed Sunday through Tuesday. There are daily specials. We both order the BBQ chicken special which comes with rice and collard greens. All cooked just right and oh so good. Niki says the sweet iced tea is just as good as she makes it. Desserts are made on the premises and we each tried a piece of cake – lemon for Niki and the chocolate cake for Jack. Delicious! A great meal for $30.59 with drinks and tip. "Skynyrd’s Grill & Sports Bar," 129 Motel Drive, St. George (843) 563-4112. We have stayed at this campground before. The newest, young owners from “Down Under” had plans to make improvements and develop it into its full potential. The pace is slow. There is no drainage from the sites, grass covers the formerly gravel pads. We set up with rain water 2” deep on our site. I could not find the sewer as it was flush with the ground and also under water. The fire ants which I do remember from a previous visit attacked with a vengeance while I was setting up. They tend to make resultant life miserable for at least 3 or 4 days. The sites are so close you might have trouble extending your awning. The price is reasonable if you are a PA member but we will not be staying here again unless we hear they have made significant improvements. We did order pizza - delivered to the campground. “Katie’s Best Pizza” (912) 729-5550 makes a pretty good thin crust pizza 14” Deluxe @$19.07. 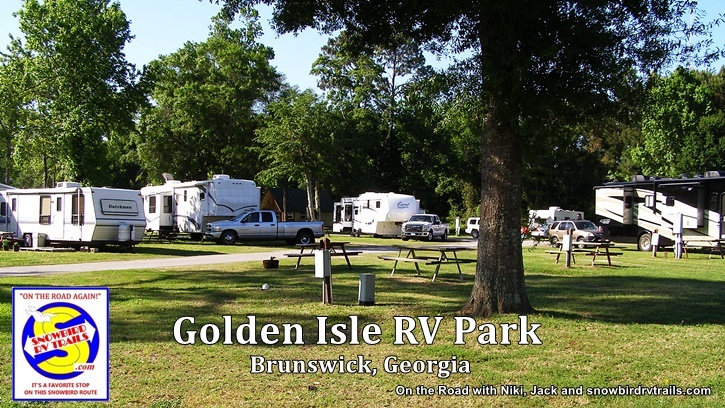 Better stopover choices (rather than Walkabout) would be Golden Isle RV Park, 7445 Blythe Island Highway, Brunswick, GA I-95, Exit 29 which is 24 miles before Woodbine - a good place to camp and take a day trip to Jekyll Island. 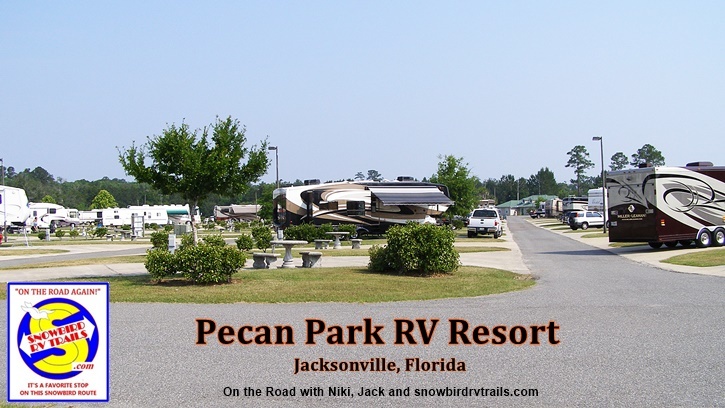 Our next choice would be Pecan Park RV Resort just off I-95 at Exit 366 in Jacksonville, FL. 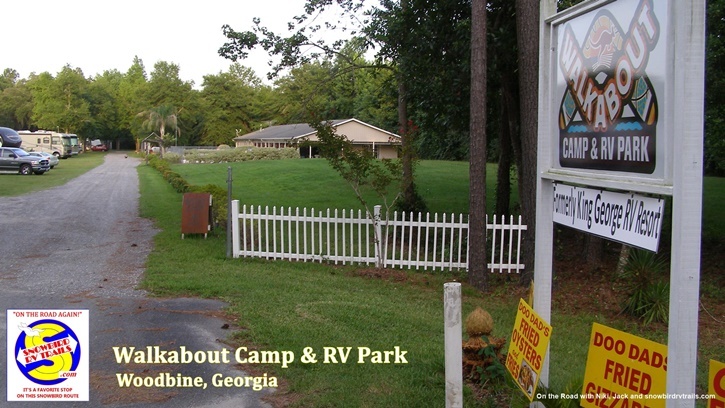 It’s actually only 24 miles South of Woodbine, GA. It is a resort with concrete pads, grass, pool and next door to a weekend Flea Market. You might enjoy the Budweiser Brewery tour also not so very far away. Is this page & our website of help to you? tell us how we can we make it better?